Undefeated featherweight prospect Tramaine “The Mighty Midget” Williams made a major statement last night (Saturday, July 29), dropping former world title challenger William “Chirizo” Gonzalez three times in the opening round of a sensational performance in the “KO Night Boxing” Rumble on the Water 2″ main event, which aired live on CBS Sports Network from The Queen Mary’s outdoor venue in Long Beach, California. “KO Night Boxing: Rumble on the Water 2″ was presented by Black Tree, and promoted by Roy Englebrecht Promotions, in association with KO Night Boxing LLC and Roc Nation Sports. The 5′ 4” Williams (12-0, 5 KOs), fighting out of New Haven (CT), exploded with pin-point accuracy, also displaying his new-found power, dropping Gonzalez 30-8, 26 KOs), of Nicaragua, three time in the first round. The crafty southpaw finished off his more experienced opponent with a perfectly placed right-left combination, right on the button, for his third and final knockdown. Referee Raul Caiz, Jr. waved off the action, not bothering to count, as Gonzalez lay vertical on his back in dire straits. 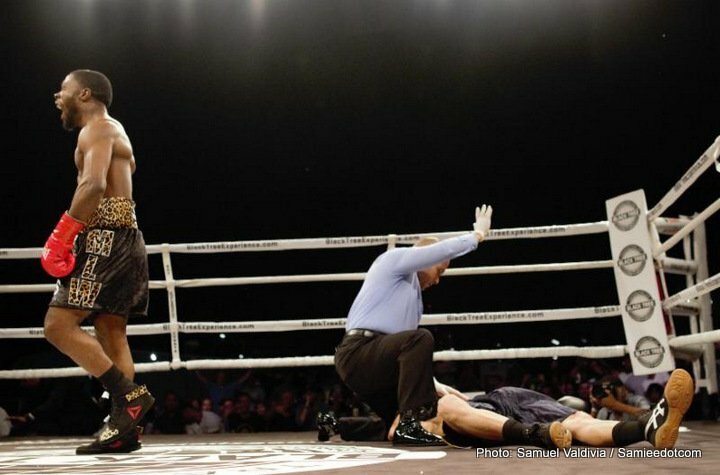 “I prepared well for this fight and anything can happen when I work hard,” Williams remarked after his third consecutive knockout victory. “I felt his power early with a body shot but I stayed focused. In the co-feature, highly touted super middleweight prospect Junior “The Young God” Younan (13-0, 9 KOs) remained undefeated, winning a close eight-round decision against tough Mike “The Menace” Guy, of Sacramento (CA), the former California State champion. (9-3-1, 5 KOs) Guy was penalized a point for tossing Younan to the mat at the end of round six or the result would have been a majority draw. In his first eight-round fight, the 21-year-old Younan gained invaluable experience fighting the non-stop Guy, who kept coming forward, throwing punches from all angles, at his Brooklyn opponent. Former Winthrop College (SC) basketball player Jonnie Rice (7-2-1, 4 KOs), fighting out of Los Angeles, opened the televised broadcast with a convincing six-round unanimous decision over Rodney “King Corso” Hernandez (10-6-2, 2 KOs), of Fresno (CA). Hometown favorite Raul Calderon (1-0) pitched a shutout over Eric Gomez (0-1), winning a four-round unanimous decision (40-36 X 3), in a battle of pro-debuting Californians. In the walkout-fight, Los Angeles featherweight Sergio “El Nino” Quiroz improved to 4-0 with a four-round unanimous decision over Lupe Arrotyo (2-7).